Hello fellow Ringers. 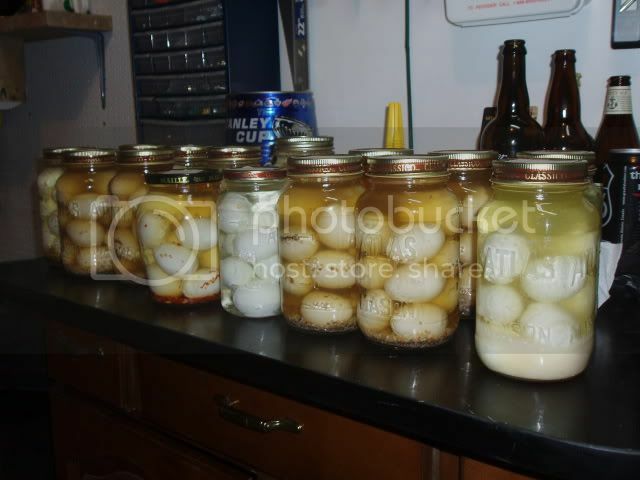 Here is my humble methodology on making pickled eggs. Believe me, I am not trying to re-invent the wheel here, this is just my take on a timeless classic. Enjoy. First of all, you need to boil the eggs. 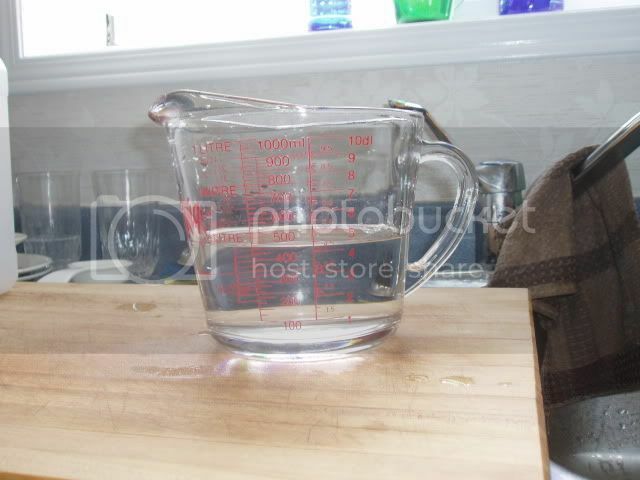 This is an 8 quart pot. 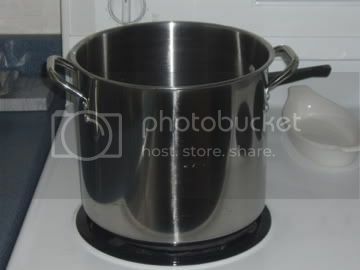 I don't like to put more than half a pot full. 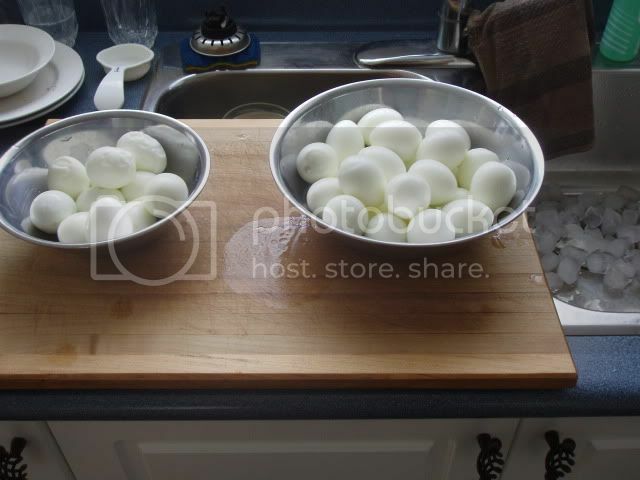 Usually you can fit about 40-50 eggs in this size pot, depending on the egg size you choose. 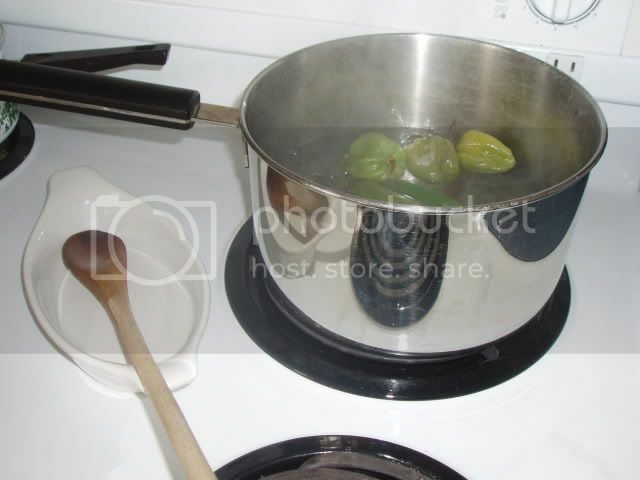 Bring pot to a full boil, remove from heat and cover and let sit for 10-12 minutes. 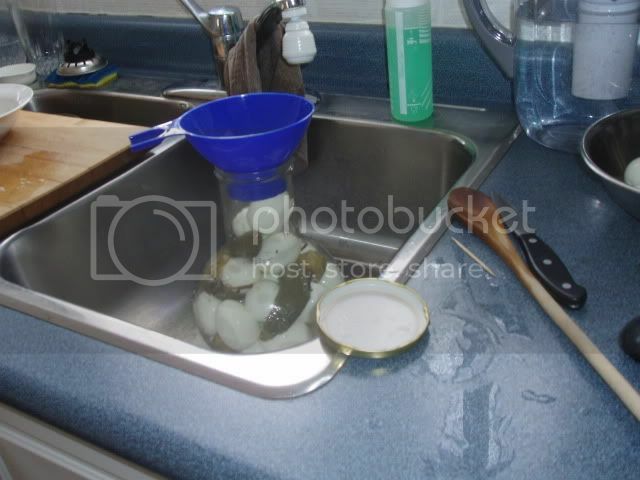 Then, drain, and fill with cold tap water and 2-4 trays of ice and sit for 5-6 minutes. This method does not over cook the egg, and there is no dark ring around the yolk. Do not drain this ice water. Crack the fat end first and then the rest of the egg. 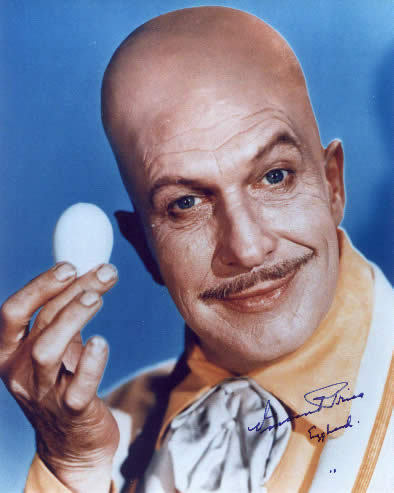 Roll egg in hands (as if you are rolling a ball of Silly Putty) but be gentle, PEEL! Be patient! Not every egg comes out perfect, so I usually have a couple of bowls to separate the bad peels. I still pickle the bad ones, they become experimental flavours. Okay, you have finished peeling all the eggs. Wasn't that fun?! 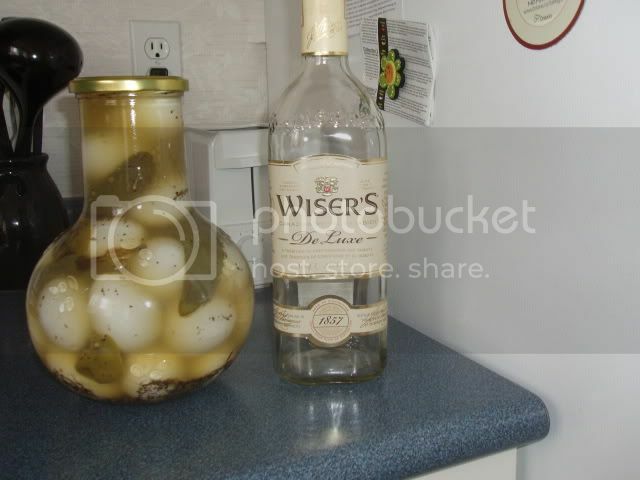 I like to use pickling vinegar in the brine because it has an acid level of 7%. I also use sea salt, but any type of salt will do, and white sugar. 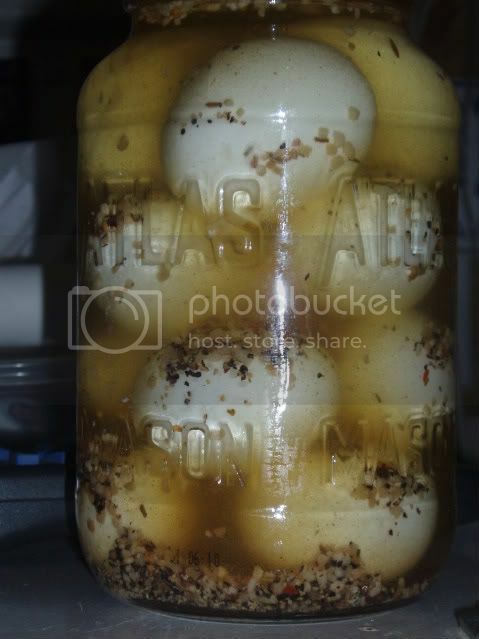 I make a standard brine every time, and then add the desired flavour to each individual jar. Bring liquid to a boil, add salt and sugar, stirring until dissolved (1-2 minutes). Cover and allow to simmer for 5-10 minutes. In this particular photo, I am blanching some habaneros and jalapenos in the brine. Stir brine. 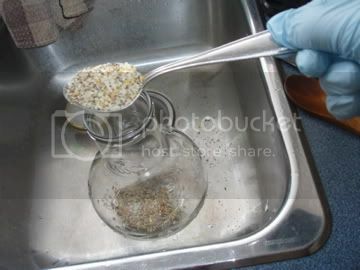 It is now ready to add to sterilized jars. 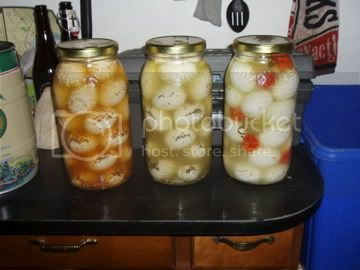 Prior to adding eggs and brine to jars, add whatever flavour you desire to the jar. I don't usually wear gloves, unless I am working with hot peppers. 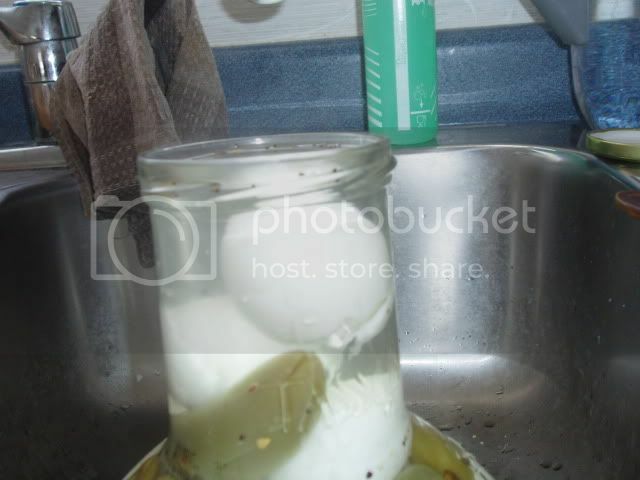 Allow jar to sit at room temperature to slowly cool down. Once jar has cooled off, give it a gentle tumble to distribute the spices. Do this every couple of days. It will be cloudy, but that is just flavour working it's way around the eggs. My signature flavour is "Steak N'eggs". This is a crowd pleaser! 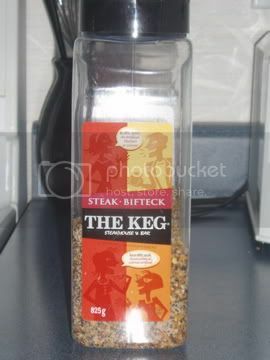 I use Montreal steak spice or whatever steak spice I have on hand. A new experimental flavour is "Chicken L'eggs". It's not bad. I have also done hot eggs. Left is "Chicken L'eggs", centre is "Steak N'eggs", and right is hot eggs using Scotch Bonnet peppers from the beautiful island of Barbados. Garlic - added a few tablespoons of granulated garlic to a jar. I put crushed chilies in a jar. I use 2 tbls of spice for every dozen eggs. Label lid with flavour and date of preparation (it's a good reference in case a jar gets lost at the back of the fridge) - which should never happen. I like to wait at least 2 weeks, but 4 is better before opening jar. 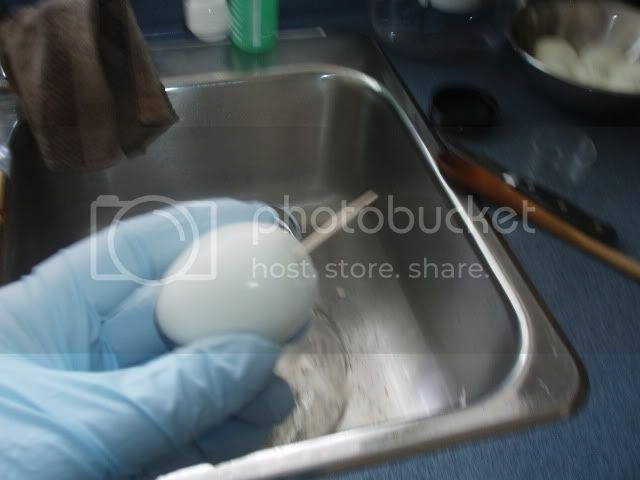 I'm glad you were egged on to do such a fun eggstravigant, eggspecially full photo eggsay! What eggselant work you do! Thank you so much, SoEzzy! OMG! I thought I was looking into a mirror! Thanks, patruns. Great thread. Well done documenting it all so well. 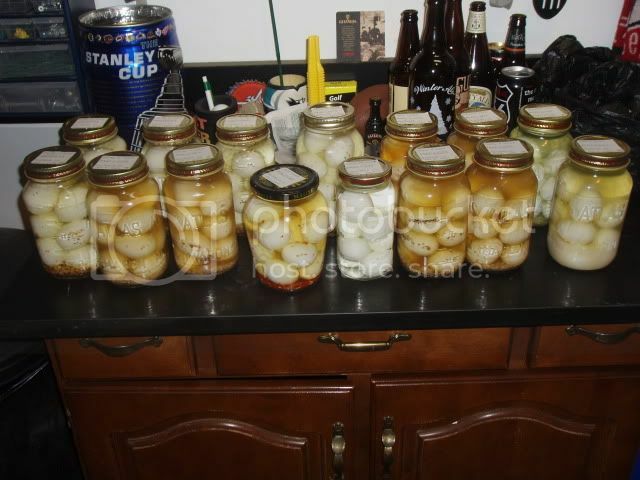 I haven't had a pickled egg in 30+ years. I was very young when I tried it. I remember going to a tavern called "Opsahls" ( Jarhead probably knows this place) that my late Dad and Uncle used to go to. 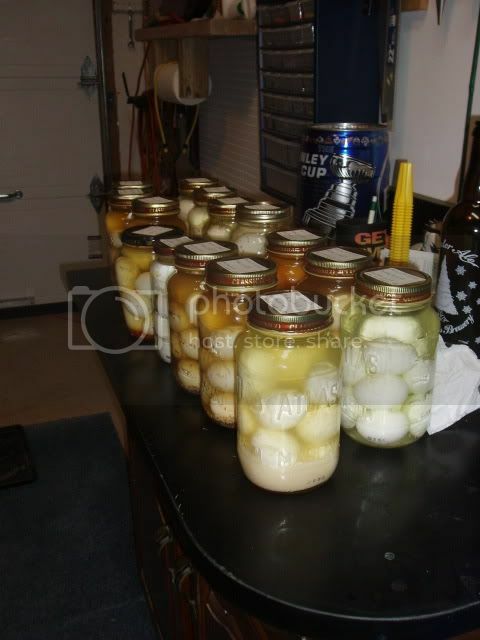 They had eggs in a big jar sittin on the bar. 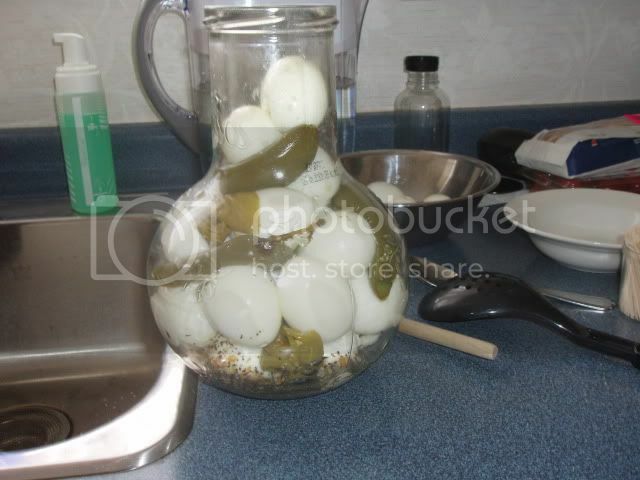 I remember being amused at the eggs in a jar so they made me eat one. I don't think I liked it too much then. When my Uncle went in there they'd see him come in and set 2 eggs and a bottle of Pabst on the bar. He used to say.."do not eat with beans, you could damage something"
I just might have to make a small jar in their honor. Great story, 12TH AV SMOKERS. Always keep alive the memories of loved ones, past and present. Awesome job....thanks for sharing. reat pics! Ever tried smoking your eggs instead of boiling? It adds a whoole different level of flavor. Q'n for the glory of God! I have considered it, but have not tried it. I assume you have? Do you just put uncooked eggs in the smoker? What temp? How long? Sorry, but that is a lot of questions. 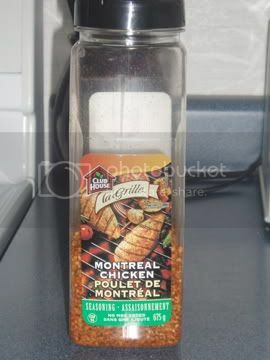 Oh, one more, what about the brine - just plain brine to take advantage of the smoke flavour? chickenman972 lets hear more on this. 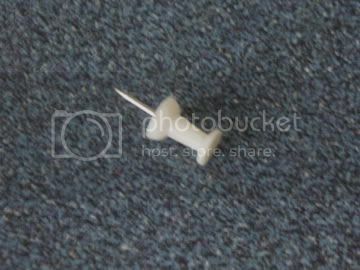 Maybe a different thread though. Good call 12TH AV SMOKERS. I most definitely want to hear more on this. I want to try it, I just need a little guidance. 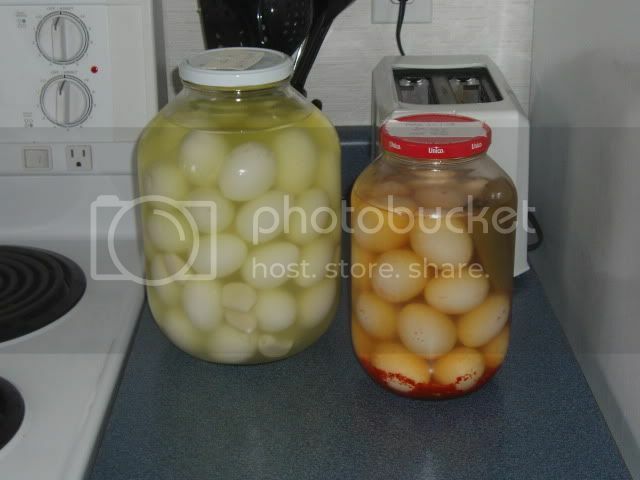 I am a big lover of pickled eggs myself but DAMNNNN how long does it take you to eat that many eggs??? Or do you sell them??? give them away as gifts??? Maybe use them as stocking suffers at Christmas time??? I mean, really.....that is a BUNCH of eggs. 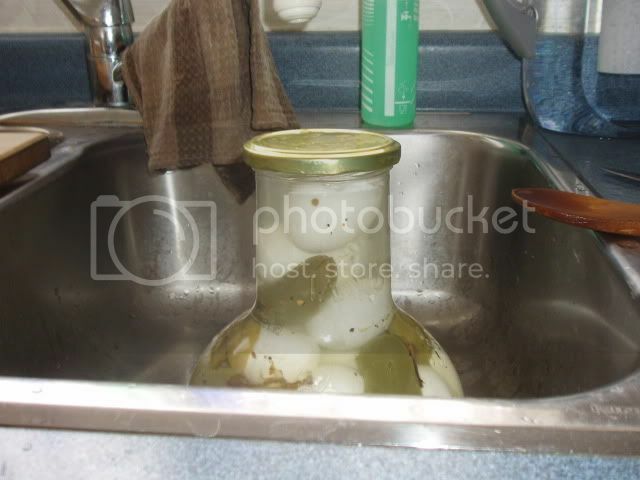 Once done and jarred, do they need to be refrigerated? Thanks, Geronimo! I do not sell them, never have. 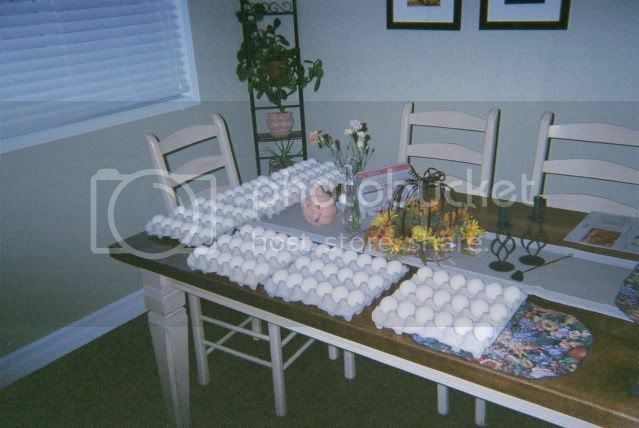 I did 450 eggs in November and gave away most of them for Christmas. I also did some for myself and my wife, who BTW loves them. I'm surprised how many women like these things. I do keep them refrigerated (or cold). I'm in Canada, so right now my fully insulated garage is like a big fridge. It can be 20 below outside, but nothing freezes in the garage. I put my beer on the floor, and it is plenty cold. I do have a beer fridge in there as well, fill it with food in the winter. Thanks for posting. Ive always wanted to try that, you make it look easy. Similar story here, just change the beer to Strohs. I grew up just outside of Detroit. I'll definitely try some of these, I'm finding that at 50+ yrs. I now love a lot of food that I hated as a kid! MacEggs, Thanx for a great post, awesome job. Step by step instructions even I can follow! I'm with you and 12TH AV SMOKERS, very curious about smokin the eggs instead of boiling them. Thanx again Mark, great thread! And thanks MacEggs for the great post. Thanks Awning Guy, dmike25, and Kymike. I have already purchased my eggs. I plan on smoking about 3 dozen on March 12. 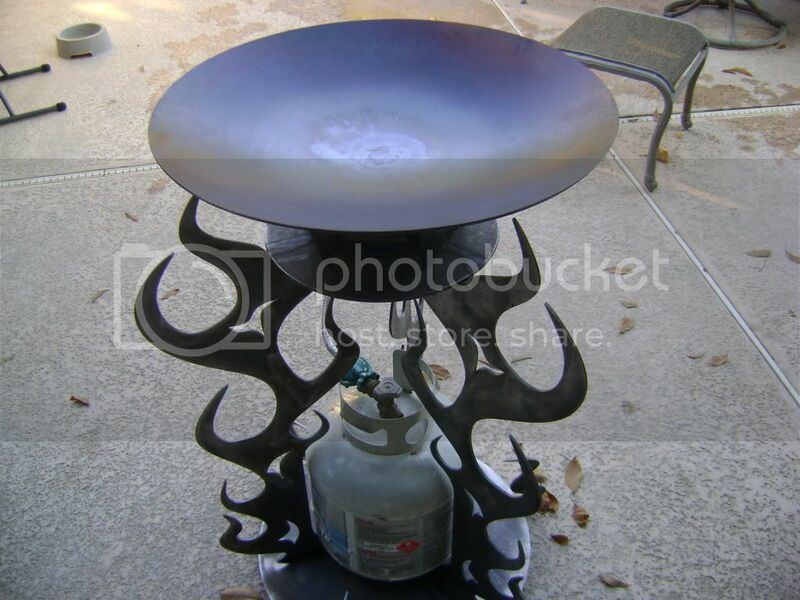 It will be my first time smoking eggs, but I gotta try it. I will try to take extensive notes and pics as well and post a new thread. I have my fingers crossed. If ya really want to spike up a batch, use some liquid crab boil on em. It will get ya attention, very spicy and very good.